The lessons learned from the Boer War and the looming probability of war in Europe prompted in 1908 the biggest reorganisation of the British Army since 1881, pushed through by the Secretary of State for War, Lord Haldane, in the face of considerable opposition. For the Gloucestershire Regiment, the two regular battalions were unaffected, and the two militia battalions saw the greatest changes. 3rd (Militia) Battalion became 3rd (Special Reserve) Battalion, its new role being to train soldiers for front line service with the regular battalions in war time. 4th (Militia) Battalion, which had seen its only overseas service in guarding prisoners on St Helena during the Boer War, was disbanded. 1st (City of Bristol) Volunteer Battalion became 4th (City of Bristol) Battalion, The Gloucestershire Regiment, Territorial Force. 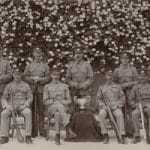 Likewise, 2nd Volunteer Battalion became 5th Battalion, The Gloucestershire Regiment, Territorial Force. In 1900 a 3rd Volunteer Battalion had been raised and this became 6th Battalion, The Gloucestershire Regiment, Territorial Force. The new 4th and 6th Battalions gave up their old full dress uniforms to adopt the scarlet of the regulars, but 5th Battalion retained its rifle green uniform until 1925. The privilege of wearing the Back Badge was not granted to the Territorials until after the Great War. For service dress, the Territorial battalions wore the familiar khaki in which the British Army went to war in 1914. “Strict fire discipline and economical use of ammunition are to be enforced. This is most easily ensured by one round of ammunition only being issued per man. The remainder must be carried in carts or on mules at the base, and in no case should be issued. “Troops are not supposed to be in possession of any ammunition not actually carried.”* This would be fatal. But field training kept ahead of the regulations, and the application of rapid fire, the so-called “Mad Minute”, where soldiers were expected to fire at least fifteen aimed rounds in a minute, could only become the effective tactic it proved to be if the soldiers were adequately issued with ammunition in the first place. The Regular Army of 1914 proved the point. Picture: 2nd Battalion Shooting Team, circa 1910.